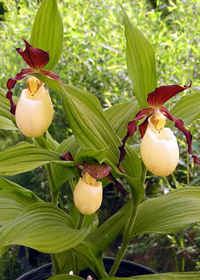 The largest flowered of all the Cypripedium and one of the easiest to grow! Petals and sepals are greenish striped and mottled with purple while the very large lip, or pouch, is a creamy ivory or pale yellow. Best grown in the shade with 2-3 hrs. of morning sun.